Fusion energy offers the possibility of a highly potent power source without waste and dangerous emissions, and with almost unlimited fuel. PACE speaks to physicist Richard Garrett about Australia’s role in a promising fusion project. Discussions about the best way forward for energy production and supply invariably centre on the pros and cons of renewable sources, such as solar and wind, and the various debates about how to transition from fossil fuels to these environmentally sustainable solutions. When nuclear power is brought up, discussions tend to circulate around nuclear fission and the weighing of the costs and benefits of an energy source that provides high output with low greenhouse emissions, but which, in the process, produces hazardous radioactive waste. But what about a nuclear energy source that can, potentially, provide even higher energy output than fission, but without the dangerous, long-living waste – what about nuclear fusion? The energy source of the sun and other stars, nuclear fusion is a reaction in which two or more hydrogen nuclei collide and fuse into heavier helium atoms. This process releases enormous amounts of energy. In the twentieth century, fusion science determined two hydrogen isotopes – deuterium and tritium – to be the most efficient in terms of their fusion reaction, producing the highest energy gain at lower temperatures. Very high temperatures (approximately 150,000,000°C) are required to produce fusion in a laboratory setting. At extreme temperatures, electrons are separated from nuclei and a gas becomes a plasma. Fusion plasmas provide the environment in which light elements can fuse and produce energy. Producing a viable source of energy generation from fusion plasmas has proven to be an elusive goal for well over half a century. But in Saint Paul-lez-Durance in southern France, a 35-year-old international collaboration between 35 countries is bringing the possibility of fusion energy closer than ever before. 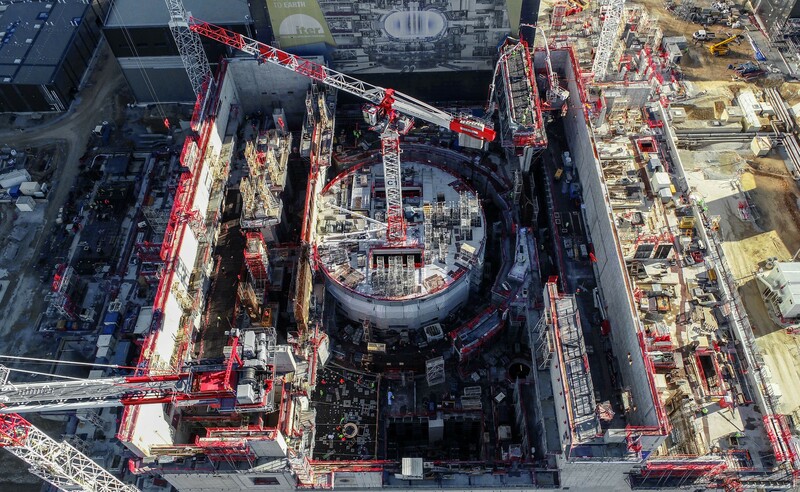 Named ITER (Latin for “the way”), the project is the most ambitious attempt to prove the viability of fusion as a source of large-scale carbon-free energy. The project is building the world’s largest tokamak, a 23,000-tonne reactor that can confine and compress plasma into a doughnut shape in a powerful magnetic field. The term “tokamak” is a Russian acronym that stands for “toroidal chamber with magnetic coils.” First developed in the Soviet Union in the 1960s, tokamak technology is considered to be the most promising configuration for a magnetic fusion device. the superconducting magnetic coils placed around the vessel, which enable the extremely hot plasma to be kept away from the walls of the tokamak. 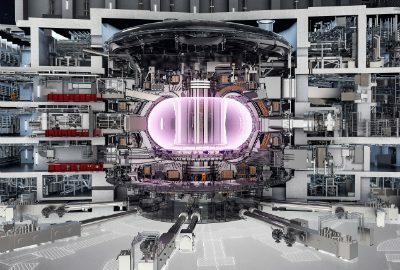 It is hoped that the ITER tokamak will be the first fusion device to produce net energy – where the total power produced exceeds the thermal power injected to heat the plasma. The project is now around 60 per cent complete, with plans to have the tokamak up and running by 2025. The buildings of the tokamak complex (tritium, tokamak and diagnostics buildings, from left to right) and the seismic isolation system underneath the complex. Australia has a long history of involvement with fusion research. Australian scientists Mark Oliphant and Paul Hartek, under the guidance of Lord Ernest Rutherford, were the first to identify a fusion reaction in their lab by firing some deuterons into a deuterium gas. Over the past half-century, the Australian fusion community has carried out important research. In 1946, Australian scientist Peter Thonemann pioneered studies of plasma magnetic confinement in a toroidal configuration at Oxford University. The design was the basis of the tokamak reactor. In the 1960s, the Australian National University (ANU) built and operated the first tokamaks outside the Soviet Union. In January this year, Dr Richard Garrett from the Australian Nuclear Science and Technology Organisation (ANSTO) attended the most recent meeting of the coordinating committee of the International Tokomak Physics Activity (ITPA) in France. While there, they discussed the most recent developments on the ITER project, as well as the next steps ahead. Garrett was also able to visit the construction site where the tokamak will eventually be situated. “It’s approximately 60 per cent complete now. Construction is being carried out hammer and tongs. There are thousands of workers on-site, with huge infrastructure being erected,” he told PACE. Some of the more recent progress on the site has been the construction of a massive assembly tool that will put the tokamak together – an impressive engineering feat in itself. “The site up to now has been dominated by a massive assembly building. 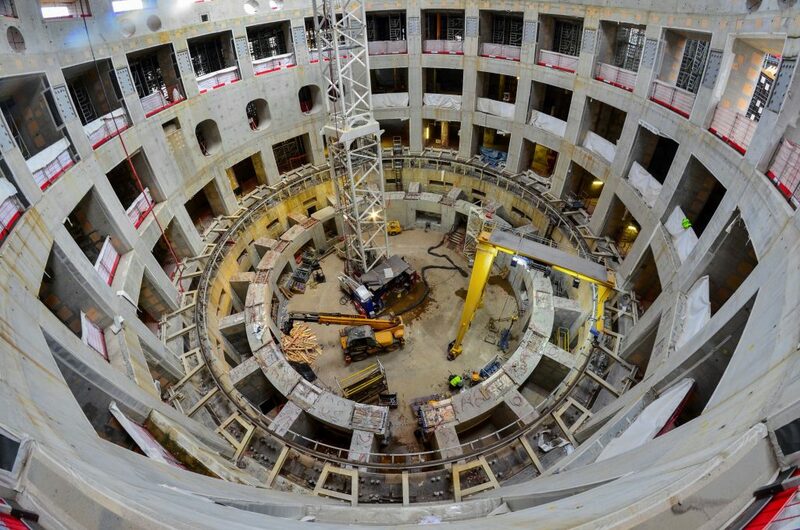 Now, the huge concrete structure that will house the tokamak itself is taking shape. 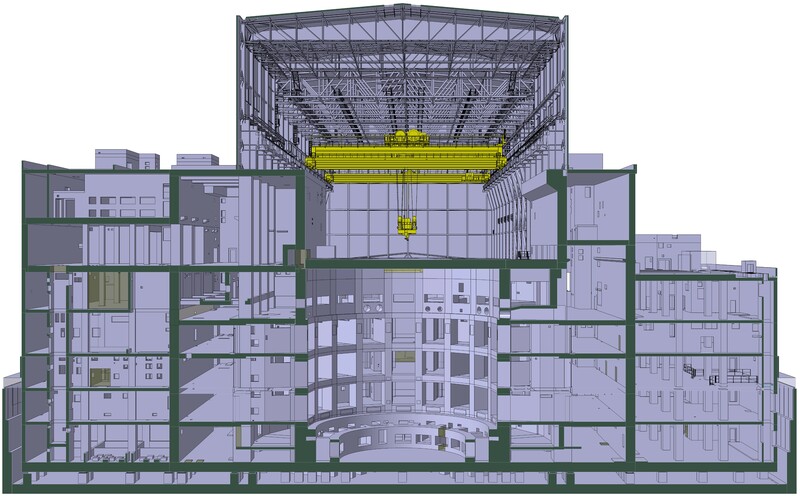 Segments of the tokamak structures and components will be assembled in the assembly tool, and will then be craned and lowered down into the tokamak pit, where they will then be fitted together like segments of an orange,” Garrett explained. The ITER construction site in February 2019. While not being a member state, Australia has in recent years become closely involved in the ITER project, signing a technology cooperation agreement in 2016. “Until recently, the project was basically closed off to all apart from the member states. Australia was the first country outside the member states to sign anything like this. Basically, what it means is that we can undertake research with all the same advantages as the members,” Garrett said. Garrett himself was closely involved in establishing the relationship with the project. “Australia had a seat at the International Energy Agency forum, which overlooks some of the fusion research. I started going to the meetings, and ITER would come and report each year. So that set up a bit of a relationship. The head of ITER science and operations at the time was an ex-pat Australian and we started working on the possibility of some kind of official engagement with ITER. That’s how it started,” he said. Six Australian universities are working with ANSTO to participate under the terms of the agreement, which ANSTO signed on behalf of the Australian fusion research community. This plasma diagnostic imaging instrument operates at the emission lines from elements in the plasma, including impurities that, for example, have come off the walls or other surfaces. “It will enable us to measure, element by element (if you can get enough light) what the velocities are, what the temperatures are, and other instabilities,” Garrett said. European contractors working in the tokamak pit in August 2018. This solid base ring and its 18 radial walls will support 23,000 tonnes of machine from below. Australia is hosting a meeting of the ITPA diagnostic technical group in April, hosted by Howard at ANU. They will be reporting on the range of diagnostics that are going to be installed, and will be trying to set priorities, determining which need the most work, and what diagnostics have to be developed. The major focus of the ITPA is ITER, but they are also looking ahead as well, determining what research we need to do for the next step. And that next step, after the successful completion and demonstration of ITER, will be the development of a trial fusion power plant. While ITER is designed to produce 10 times more energy than used to create the plasma and to maintain it via the fusion energy – the fusion energy generated will actually maintain the plasma – it will not itself be a power reactor. It is an experimental device with ports all over it for all different sorts of diagnostics that will refine what is needed for a real power reactor. And the project to create that reactor is DEMO – Demonstration Power Reactor. DEMO will be the machine that will bring fusion energy research towards a prototype fusion reactor and open the way to the industrial and commercial development of fusion energy. While progress has been made in recent years, according to Garrett, most prognoses on the widespread commercial introduction of fusion- sourced energy place the timeframe in the 2050s. It has taken many decades to get to where we are today with the ITER project, and it will, therefore, take several decades more to have fully functioning fusion power generation. Garrett said that there was an increasing sense of urgency about the transition to non-fossil, fuel-based energy sources, including fusion. “In some countries there is huge investment going into the non-emitting forms of energy. China and in India, for example, are seriously invested in both this and in next-generation fission reactors as well,” he said. “It still remains to be shown, I think, that you can run a power grid using intermittent sources, such as wind and solar, and it still seems likely that we will need some base load component – and there are not many of them that aren’t fossil fuel based. Fusion could be the solution here. With the looming problems of climate change on the horizon, or already occurring, ITER, it appears, could well be one of the world’s most important scientific and engineering projects. And Australia, through its involvement in the project, is getting access to some of the top infrastructure, technology and research in the world.